Acceptance and Commitment Therapy for Interpersonal Problems presents a complete treatment protocol for therapists working with clients who repeatedly fall into unhealthy patterns in their relationships with friends, family members, coworkers, and romantic partners. These clients may blame others, withdraw when feeling threatened, react defensively in conflicts, or have a deep-seated sense of distrust—all interpersonal problems that damage relationships and cause enormous suffering. 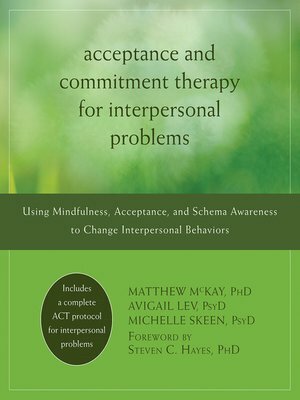 This book presents an acceptance and commitment therapy (ACT) approach—utilizing a schema-based formulation—to help these clients overcome maladaptive interpersonal behavior. First, clients learn how schema avoidance behavior damages their relationships. Second, clients face "creative hopelessness" and practice new mindfulness skills. Third, clients examine what they value in their relationships and what they hope to gain from them, and translate their values into clear intentions for acting differently in the future. And lastly, clients face the cognitive and emotional barriers standing between them and values-based behavior in their relationships. By learning to act on their values instead of falling into schema-influenced patterns, clients can eventually overcome the interpersonal problems that hold them back.